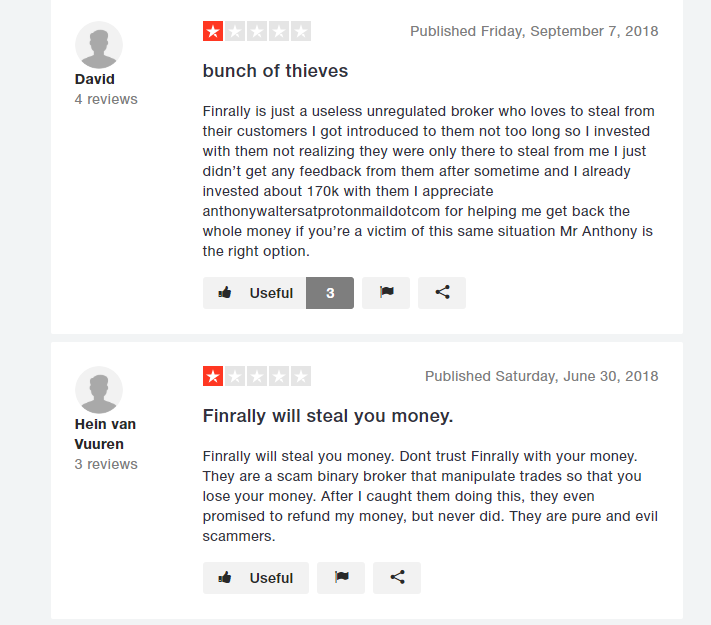 > REVIEWS > FinRally Broker Review: Is Finrally A Scam Or Legit Binary Broker? Finrally Review: Safe Or Scam Broker? Finrally is a Binary options broker established the year 2017. From our findings,this company is owned by Affort Projects S.A, and have their address at 309 Premier Building, Albert Street, Victoria Mahe, Seychelles. They can also be reached via calls with this phone number-+44 20 3808 8047. Inasmuch as this Broker looks promising, We would like to remind the public that they are unregulated. What this means is that they are not licensed to provide the service they offer. Also, although there are positive reviews online about this broker, there are a couple of negative ones recently. With users complaining of trade manipulation, inability to withdraw e.t.c. Finrally is among the newest brands to enter the binary options market. While it’s easy to assume that this is just another brokerage offering the same old regular trading experience, there are a lot of improved and new features that makes them stand out from the rest. However, we are not convinced about this Broker. Reviews online show that they are not trustworthy. We advise you to trade with caution.